Scott Denning is Monfort Professor of Atmospheric Science at Colorado State University. 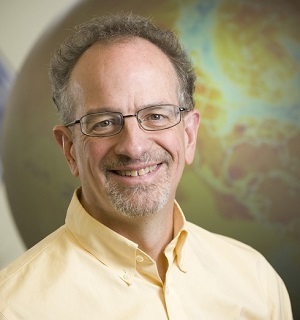 He also serves as Director of Education and Diversity for CMMAP, the Center for Multiscale Modeling of Atmospheric Processes, working to enhance understanding of global climate. He is author of over 100 publications in the peer-reviewed climate literature, is a former editor of the Journal of Climate, and served for five years as founding Science Chair of the North American Carbon Program. He has served on advisory panels for NASA, NOAA, the US Department of Energy, and the National Science Foundation. Denning leads a group of graduate students and scientists using many kinds of observations and models to understand the metabolism of the Earth’s biosphere. A key contribution of their work is the identification and prediction of sources and sinks of carbon dioxide in the atmosphere using new satellite instruments. In addition to using global satellite imagery, he uses data from the woods of Wisconsin, the farms of Iowa, the Oklahoma prairie, the African Savanna, and the Amazon rainforest. Denning takes special delight in discussing the subject of climate change with hostile audiences and has twice been a featured speaker at the Heartland Institute’s annual conference. Talk Title: "Simple, Serious, and Solvable: The Three S’s of Climate Change"
Climate Change is Simple. Heat in minus heat out equals change of heat. When Earth absorbs more heat than it emits, the climate warms. When it emits more than it absorbs, the climate cools. This simple principal explains why day is warmer than night, summer is warmer than winter, and Miami is warmer than Minneapolis. It also explains why adding CO2 to the air causes global warming. The absorption of thermal infrared radiation by CO2 was first measured 150 years ago, has since been confirmed thousands of times by labs all over the world, and is extremely well understood. There is no doubt at all that adding CO2 reduces Earth’s heat emission and therefore causes global warming. Climate Change is Serious. Warmer average temperatures are associated with dramatic increases in the frequency of extremely hot weather. Warmer air evaporates more water from soils and vegetation, so even if precipitation doesn’t change the demand for water will increase with warmer temperatures. Adding water vapor to the air also means there is more water available for heavy rains when the right conditions occur: this means that in addition to more drought, a warmer climate will include heavier rainfall during extreme events. Warmer ice sheets release more water the oceans, which also expand as they get warmer. These two influences raise sea levels, threatening coastlines everywhere. Higher seas imply much more frequent coastal flooding, requiring abandonment long before mean sea level reaches coastal infrastructure. Without strong policy, these impacts will become more and more severe almost without bound, growing to become the most serious problems in the world and lasting for many centuries after fossil fuels are abandoned. The consequences of unchecked climate change to the global economy are unacceptable. Climate Change is Solvable. Preventing catastrophic climate change will require abundant and affordable energy to be made available to people everywhere without emitting any CO2 to the atmosphere. This will require both the development of energy efficient infrastructure and very rapid deployment of non-fossil fuel energy systems, especially in the developing world. From an engineering perspective, both objectives are eminently feasible with mature technologies. Economically, the clean energy transition will be expensive, involving roughly 1% of the global economy. This cost is comparable to previous development achievements such as indoor plumbing, rural electrification, the global internet, and mobile telecommunications. Our descendants will better lives by developing and improving their infrastructure just as our ancestors did. Denning will present the keynote talk at 4:00 pm in the North Ballroom of the Student Union Memorial Center.